Welcome to ‘Legendary Lefty’ — a series of interviews that reveals the personal stories of our amazing team members. Today, I had the pleasure of chatting with Joe Deobald, our Entrepreneur in Residence. I learned how his career path started with a lawn mowing business, how he obtained Django (Left’s “Director of Greetings” or “D.O.G.”), and how his entrepreneurial spirit led him to Left. Amber: Where are you originally from and when did you come to BC? Joe: I’m originally from Moose Jaw, Saskatchewan. A natural born ‘farm boy’. My family and I moved out here when I was about 11 for elementary school; we bounced around a lot when I was young. I went to highschool at Princess Margaret Secondary School and during grades 11 and 12 I was at KPU [Kwantlen Polytechnic University]. After graduation I went to BCIT and SFU. Amber: So you took university classes during high school at Kwantlen University? Joe: Kwantlen had advanced courses that a select few students could take, as long as you had good grades. I was one of those few people, so I took computer programing and fine arts. Amber: That is an interesting combination! What drew you to fine arts and computer programing? Joe: Yes [laughing]! A unique skill set I guess. I think very analytically, but I am also very creative. I wanted to develop those two assets. In highschool, and I guess in elementary school too, all my hand-in reports were always over the top. Teachers would keep my work, everything from humanities reports to physics diagrams, as an example of what could be done [laughing]. Amber: What was your first business and how old were you? I’m picturing an elaborate lemonade stand. 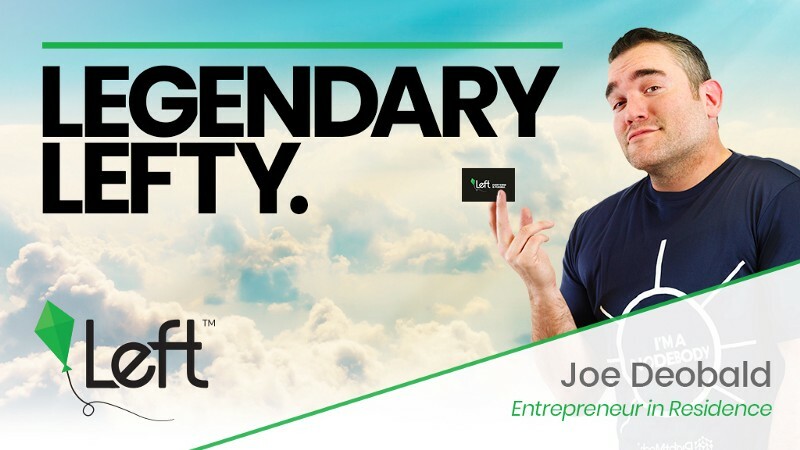 Joe: I started my first business when I was 13 in lawn maintenance. I would go around the neighbourhood with my push mower, cutting grass. After a bit of success, I expanded to about a five block radius. When I had enough money, I bought a weedwacker and upgraded to an electric lawnmower so it was a bit easier and I could do more with less. I had about 20–25 yards I took care of each week. Lemonade didn’t have the returns I was looking for. Joe: Yes [laughs]! I needed to make the job easier on myself! Amber: So, after university what did your career path look like? Joe: I started a company called SilverWayve with a buddy of mine from college… it just didn’t pan out. After that I moved to Eyestorm Media which was basically a freelancing gig where I built my own personal brand. Following that, I got a full-time job working at CityMax. I was hired as a junior designer and worked my way up to being the Creative Director. That is where I first met John (Co founder of Left). When CityMax started to go downhill, I decided enough was enough; I was an entrepreneur at heart, and I needed to start my own practice. I founded a branding marketing agency called Full Frame Marketing Inc.
Amber: And how did you first start working with Left? Joe: John had left CityMax just before I did to start-up a new venture with Chris Jensen called Left of the Dot Media. It had a horrible logo [laughs]. John reached out and asked me to help them on some projects. I came on and started working from their office which was close to my home in Pitt Meadows. The first project I worked on was importers.com. After that, we started working on some cool brands like massage.com, villas.com and christmas.com. I started taking on more and more clients with Full Frame, and Left became one of the biggest of those. As Left grew, I started getting too much work to do myself, so I started hiring people. I found some designers who I could nurture, and I brought them on to grow the business. With a team, I could focus on strengthening relationships with clients and forming new partnerships, which was always a part of my business model. Amber: So you started by having Left as one of your clients. How did it transform into them acquiring your new marketing company ICO Agency earlier this year? Joe: Over the years, I helped start multiple businesses, such as ShareShed, Guiides.com, Orange Envelope, Grayns and ICO Agency, all of which led me to Left. Left was working on the RightMesh project, and my company, ICO Agency, had taken on the marketing. The work we were doing for RightMesh led John and Chris to clearly see the potential of the team I had built. The three of us sat down, in this boardroom actually, and we decided to have Left acquire ICO Agency in order to lock up the talent of the team for Left. Although it had felt like I was a part of the team for many years, that was the moment when I became an official Lefty, and my title became Entrepreneur in Residence. My role is to “build the thing that builds the thing”. I get to do all the cool stuff that entrepreneurs get to do — establishing processes, bringing people onboard, helping people where they need to be helped, developing the culture, and scaling certain areas in the business. My next big project is preparing us for growth as we are going to become too big for our current space. I am currently looking into options of our next move. Amber: That is quite the journey! What is it that you like most about being an entrepreneur? Joe: I have always liked the challenge of it. The challenge of taking an idea and running with it. Growing up, my parents were always supportive of my ideas, but we lacked business connections, and even internet, to bring them to life. Over time, I got frustrated seeing the ideas I had thought up created by other people. So, at an early age, I decided to take initiative and run with the ideas myself. Even though sometimes the ideas didn’t work, I needed to try. I needed to know why it wouldn’t work before giving up on an idea. You learn more from your mistakes that way. That is what life is, it is all about failure and learning from it. So that is what I like about being an entrepreneur. Amber: On that note, which of Left’s 10 core values do you identify the most with? I can kind of guess after hearing your last statement. Joe: “Failure is an option” is one of the core values that I most identify with. Because if you don’t fail, you never learn. Failure makes you humble, and it makes you realize that you are never going to be perfect. You are going to fall, sometimes really hard, but you’ll be able to pull yourself up and hopefully you will have a network of support to help dust you off. Having those relationships in your life that support you really helps. Amber: On a slightly random note, you are in charge of Django, Left’s resident “D.O.G.” (Director of Greetings). How long have you had him, and how did you become his proud owner? Joe: I have had Django for four and a half years. We got him when he was about four months old from Alberta. He was a rescue pup. They found him with his brother and his sisters in a back alley, in a box, and they were eating rocks. We found him online, and I was like, ‘kay this dog is pretty dang cute’, and I reached out to the foster family. We flew him out, and I picked him up at the airport at about quarter after midnight. He came down the ramp in a crate, his ears down, and he looked pretty sad, still shocked from the flight. We got him home and took him out to the parkade and we became instantly connected. It was pretty cool feeling. His original name was Ricky, and so I had to change that. The movie Django had just come out and I thought it was fitting for his journey. Although he was Django chained for a few months while he was trained. He grew up as a Lefty. 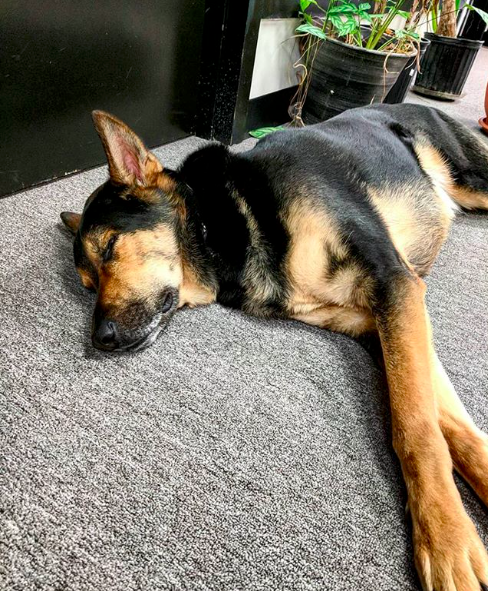 We’ve always had a dog friendly office, and he grew up here. This is his family, this is his home, he knows who belongs here and who is a visitor — and you can tell by the greetings he gives. He is an awesome dog. Great personality, lots of energy and loves being part of bleacher talks, meetings and even new Lefty interviews. Amber: I think so, too. Before I let you go, do you have any final thoughts you would like to share about Left? Joe: I think that Left has changed the way we do business and how we connect with people. Not just external, but internally as well. This is felt by everyone who has become a part of Left, from our Lefties, to the people who come through our doors for a visit, to those we meet at events. I really love working here, and I am looking forward to what will come next.